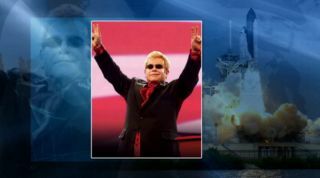 Elton John recorded a special message to accompany his "Rocket Man" song for the wake-up call on Flight Day 6 of mission STS-135. This story was updated at 10:03 p.m. ET. When NASA's space shuttle program draws to a close this week, another long-standing tradition will end with it, at least for a while — the astronaut wake-up song. NASA has used music to awaken astronauts on space missions for at least four decades. But the music will stop when the shuttle Atlantis returns to Earth this Thursday (July 21), wrapping up the final mission of the shuttle program after 30 years of operation, NASA officials said. "There aren't wake-up calls on the space station," NASA spokeswoman Kylie Clem told SPACE.com. "I don't think that there's a plan to start them, either." The last wake-up song ever for the space shuttle program awoke the Atlantis crew late Wednesday (July 20) to rouse the astronauts for their final day in space. The tune? Kate Smith's rendition of Irving Berlin's "God Bless America." "What a classic patriotic song," Ferguson said. "So appropriate for what will likely be the shuttle's final day in orbit . Thank you to America for supporting this program, and we'll see you in a few short hours hopefully." Wake-up songs are traditionally selected by flight controllers or by astronauts' friends and family, NASA officials said. The rousing playlist for Atlantis' STS-135 mission has included, among others, Elton John's "Rocket Man" (flight day six), R.E.M. 's "Man on the Moon" (day seven) and Beyonce's "Run the World (Girls)" (day nine). These three artists all sent special messages to Atlantis' crew to go with their songs, helping to commemorate the final mission of NASA's storied shuttle program. "Good morning, Atlantis. This is Elton John," John said. "We wish you much success on your mission. A huge thank you to all the men and women at NASA who worked on the shuttle for the last three decades." Beyonce voiced similar sentiments, addressing all four Atlantis astronauts: commander Chris Ferguson, pilot Doug Hurley and mission specialists Sandy Magnus and Rex Walheim. “Good morning, Atlantis. This is Beyonce," she said. "Sandy, Chris, Doug and Rex, you inspire all of us to dare to live our dreams, to know that we’re smart enough and strong enough to achieve them. This song is especially for my girl, Sandy, and all the women who’ve taken us to space with them and the girls who are our future explorers." NASA is retiring the space shuttle to focus on exploring farther afield. The agency has plans to send astronauts to an asteroid by 2025 and then Mars by the mid-2030s. It will rely on Russian Soyuz capsules to ferry Americans to the space station for the next several years, until private American spaceships are ready to perform this taxi service. But space may not stay silent forever. The wake-up music may come back when NASA's next-generation spaceship — known as the Multi-Purpose Crew Vehicle — is up and running, or when commercial craft are flying on a regular basis. Several different companies have said they hope to be operating vehicles in low-Earth orbit by 2015 or so. "Those could have wake-up songs," Clem said. You can follow SPACE.com senior writer Mike Wall on Twitter: @michaeldwall. Visit SPACE.com for complete coverage of Atlantis' final mission STS-135or follow us @Spacedotcomand on Facebook.